I love when grooms surprise their brides with fun performances during the reception. For this Hotel Figueroa wedding, groom Corey Nickols prepared a hilarious dance for his new wife. In all the pre-wedding excitement, the groom (who is also a professional photographer) didn't get around to mentioning the dance to me. So I was just as surprised as the bride. 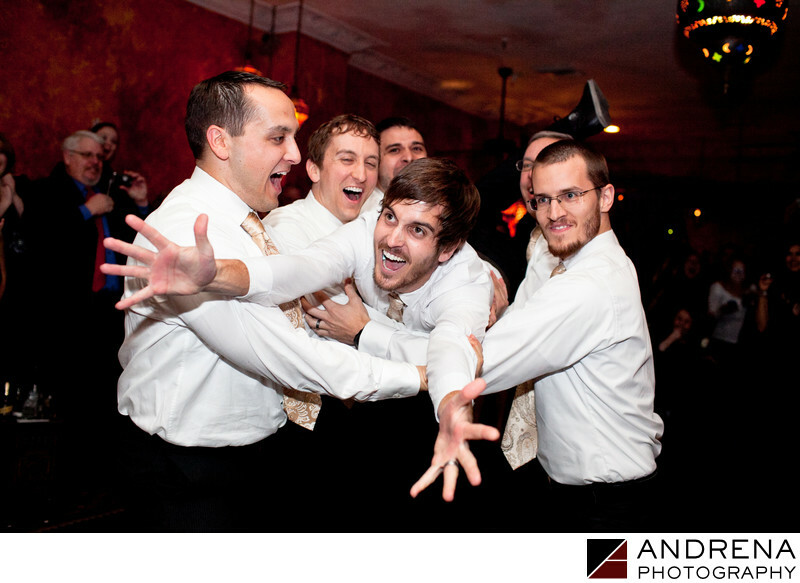 The highlight of the dance was the very end, when Corey jumped into the arms of his groomsmen. I happened to be in the right place at the right time, and was able to capture this fun photograph. The use of off-camera lighting helped give this image some nice modeling. This reception took place in one of the beautiful underground rooms at the Hotel Figueroa. The rust-colored walls are so beautiful, and the Moroccan decor is so beautiful that couples don't have to invest anything in extra decor. It's a truly fun place to have a wedding. Wedding photographed at the Hotel Figueroa, Los Angeles.